mada nenjE – Oh mind, which is obedient towards me! adhuvO nanRu enRu angu amarulagO vENdil adhuvO poruL illai anRE – if you (AzhwAr tells his heart) desire paramapadham, the place where nithyasUris dwell, thinking that it is apt to enjoy emperumAn in paramapadham, it is not something which emperumAn cannot grant us. The term amarulagu is a modification of the term amarar ulagu (word of nithyasUris). Just as nammAzhwAr had said in thiruvAimozhi 3-3-9 “vAnavar nAdu” (the country of nithyasUris), since emperumAn created SrIvaikuNtam only for the sake of nithyasUris, AzhwAr is referring to it as amarulagu. vENdil – while emperumAn could be seen and enjoyed in this world itself, it is rare for someone to leave this aside and desire paramapadham as mentioned in periya thiruvandhAdhi pAsuram 53 “nin pugazhil vaigum than sindahiyilum maRRinidhO nI avarkku vaigundham enRaruLum vAn” (is your granting of SrIvaikuNtam to your devotees any sweeter than their minds in which they are constantly praising your auspicious qualities). The opinion here is that someone could think that enjoying emperumAn in this word is lowly since that experience is not permanent. 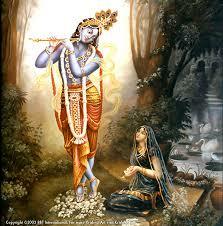 Hence someone could desire to enjoy him in SrIvaikuNtam. adhuvO poruL illai – it is not beyond emperumAn to grant us paramapadham. Just as it has been mentioned by AzhwAr in periya thiruvandhAdhi pAsuram 53 “ninnadiyArkku enseyvan enRE iruththi nI” (you are constantly thinking of what else you could do for your devotees), it is not great for emperumAn to grant SrIvaikuNtam for his devotees since he desires to grant it to them. anRu adhu ozhindhu maN ninRu ALvEn enilum kUdum mada nenjE – instead of that paramapadham, if one leaves it aside and wants to stay in this world and enjoy its pleasures, emperumAn would grant that too. When his heart asks him as to what it should do, AzhwAr tells it . . . .
kaNNan thAL vAzhththuvadhE kal – try to learn and sing praises on the divine feet of emperumAn, who is very simple towards his devotees. The opinion is that even if emperumAn is willing to give both the vibhUthis (the spiritual realm, SrIvaikuNtam and the materialistic realm, samsAram), shun both and learn to praise him. We will move on to the 68th pAsuram next. This entry was posted in iyaRpA, periya thiruvandhAdhi on January 18, 2019 by T N Krishnan.